GLOGIRLY: My Secret Paws Came! What a cool Secret Paws present. I love fev-vers, too! You got lots of goodies Stealth Cat. We love the pictures of you wif da fevers. WOW! Fabulous Santa Paws presents! Espeshully Red Mousie! Enjoy ~ but don't trip up Gloman until afta he's gived yoo your Chrismouse present! Tee hee! Wow, that's a lot of stuff! Enjoy it, Ms. Katie! Pawsome gifts! 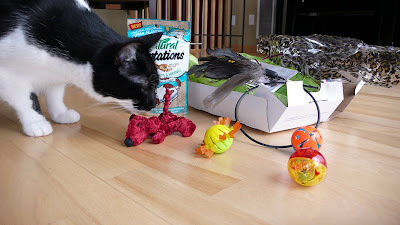 That feather toy looks like loads of fun and that red mousie is adorable. We're going to go visit Tiger Lily. Wow, nice haul, Katie! 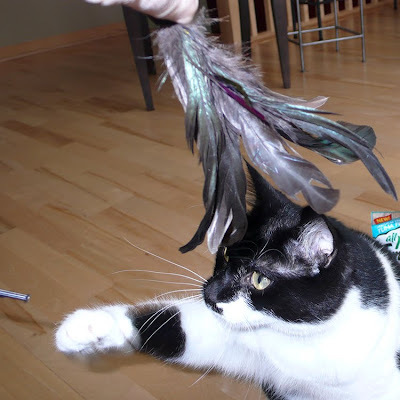 That feather toy looks fun! What totally pawsome gifts! 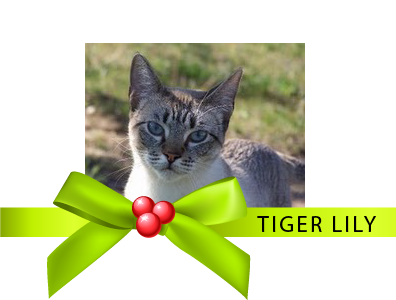 Tiger Lily and her family sent you some great stuff! Wonderful presents. 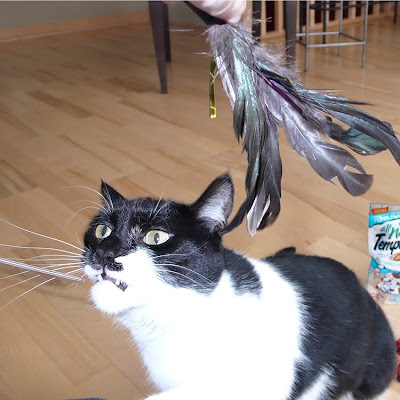 And the feather toy really brings out the inner tiger in you, doesn't it? Katie, I think Hakeem would really enjoy your awesome new Red Mouse! Perhaps I'll send him over for a play date! You have obviously been a very good cat or you wouldn't have received such nice presents. Merry Christmas!! Wow what a great SP! You've got quite a collection of red faux furries now! I think a red bird would be a good addition to your collection! Enjoy all your new toys! Wow! What a pawsome Secret Paws present! You're gonna have so much fun! Awesome fun presents! It'll be a while before you get bored. Wow what great gift you got from your secret paws! I especially liked the little red mouse. that is so neat that your things came all the way from New Mexico. I don't blame you for protecting your gifts from the others, these are your special new things, when they get older than you might want to share. 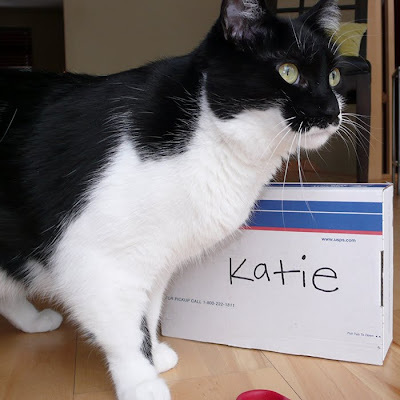 WOW Katie, you hit the secret paws jackpot, big time!!! Have the best Christmas ever!!! Great gifts, Katie. And your secret paw, Tiger Lily, is quite a little beauty just like sweet, precious you. Yay for you, Katie! What great fun with a feather wand, jingle balls and Red Mouse too! You are one lucky kitty. I hope you continue to have a fun and happy holiday! Oh we hope you have so much fun with all of your toys, Katie! We can't wait until next year so that we can participate! ps - we mentioned you in our blog today, come check it out! Tiger Lily and crew are AWESOME! They should be professional gift-getters! Awesome gifts! 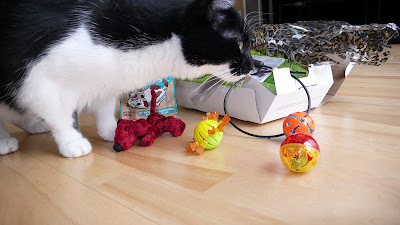 We love the balls and the mouse--we always trip our human with our toys, too. What super presents Miss Katie. We hope you have lots of fun with your new toys over the holiday season. Wow you got such great presents Katie! And as usual you did such a nice job of telling us about it all! I felt like i was there! wow Katie, your friends are so adorable, you got fabulous treats! Happy and wonderful Christmas sweet! Great Gifts, what a lucky kitty you are. I hope you enjoy them. Merry Christmas to you and your family! 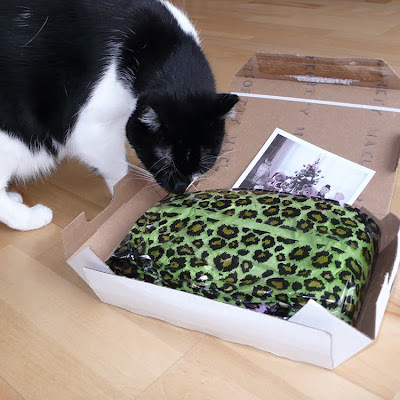 This is our first visit to your blog...you got an awesome package from your secret paws! Hope you have a great Christmas!! 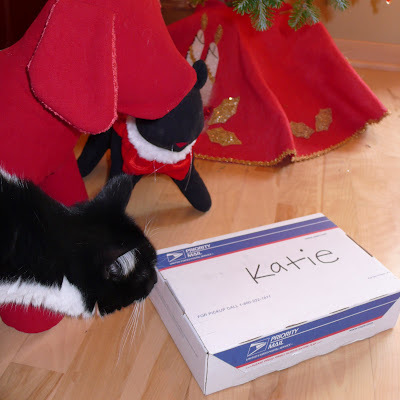 What a lucky kitty you are Katie!!! All those new toys will surely make you happy for Christmas, that's for sure! 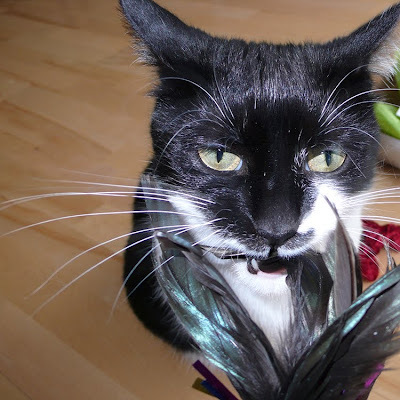 I hope you get to see your article before it's not on the front page, but Katie, you can always go to the Columnists page on www.Indiesmiles.com and then see my illustration of my tuxedo kitty and click on the link and there will be all my articles. You will find it, even if it's not on the main page anymore! Merry Christmas and a Fabulous New Year!!! Those are great gifts Katie. The red mousie looks a lot of fun. We haven't visited Tiger Lily for a long time so we will go over and say hello. We love your toys and the leopard pillow. Wonder why we always get teasing toys? What a lucky, lucky cat you are! All such GREAT loot!! I like the red mouse...FUN! We excitedly watched you open your prezzie! 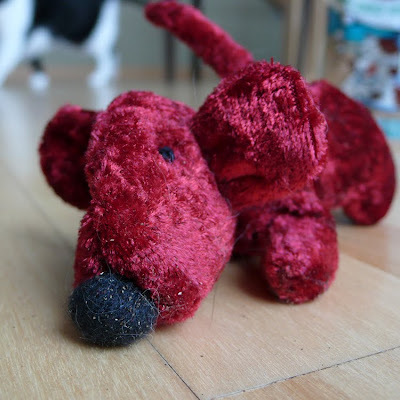 from the wild cat printed pillow to the balls to trip up Gloman...but our favorite thing was your red mousie! Black cat and Red dog will be green with envy! I have been so busy that I haven't kept up with your blog Katie. I will try to catch up. I see by your photos that you are looking as stunning as ever. I really like red mouse. We bought presents for my brother-in-laws cats. They an upstairs downstairs situation. Three have lived up stairs for a long time and three were rescued and they live in the basement with great luxuries. We boxed up a bunch of things for them for Christmas. Take care Katie and I will get caught up with all of your blogs soon.